The Elantra GT five-door hatchback, which replaces the aging Elantra Touring wagon, starts at $19,170, including shipping. LOS ANGELES -- Hyundai has priced two new variants of its hot-selling Elantra -- a two-door coupe and five-door hatchback –- at under $20,000. The Elantra sedan is Hyundai's second highest-volume nameplate, with U.S. sales of 80,114 through May, or about 27 percent of Hyundai division sales. 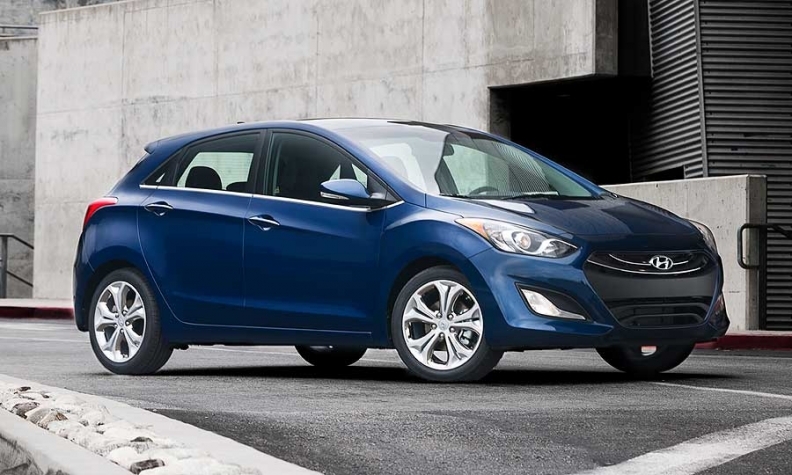 The Elantra Coupe and Elantra GT hatchback arrive at Hyundai dealerships this month. Prices for the coupe, which will compete directly with the Honda Civic coupe, start at $18,220, including shipping. The base Elantra Coupe GS comes equipped with the same 148-hp 1.8-liter four-cylinder engine that's in the Elantra sedan, teamed with a six-speed manual transmission. A six-speed automatic transmission costs an extra $1,000. Standard features include 16-inch alloy wheels, four-wheel disc brakes, air conditioning, a six-speaker audio system with satellite radio, USB and Bluetooth connectivity, heated front seats and power windows, locks and mirrors. The SE model adds a sport-tuned suspension, 17-inch wheels, rear spoiler, power sunroof and leather seats and other items. The Elantra Coupe SE starts at $20,520, including shipping. The Elantra GT five-door hatchback, which replaces the aging Elantra Touring wagon, starts at $19,170, including shipping. The hatchback is essentially a rebadged version of the Hyundai i30 sold in Europe, powered by the same 1.8-liter four-cylinder used in the U.S. market Elantra sedan. A six-speed automatic transmission adds $1,000 to the GT's base price. Hyundai sales in the United States rose 11 percent in the first five months of 2012 to 292,856.